Recently I read a statistic that boggled my mind: according to this article, the average wedding cost $30,000. $30,000??? Whaaaaattt?? Where do people GET thirty grand? Do they go into debt just for a party? Do they take out loans? We have some friends who oldest daughter is getting married in a couple of weeks, and I'll bet... well, I'll bet $30,000 that her wedding won't cost a fraction of that amount. 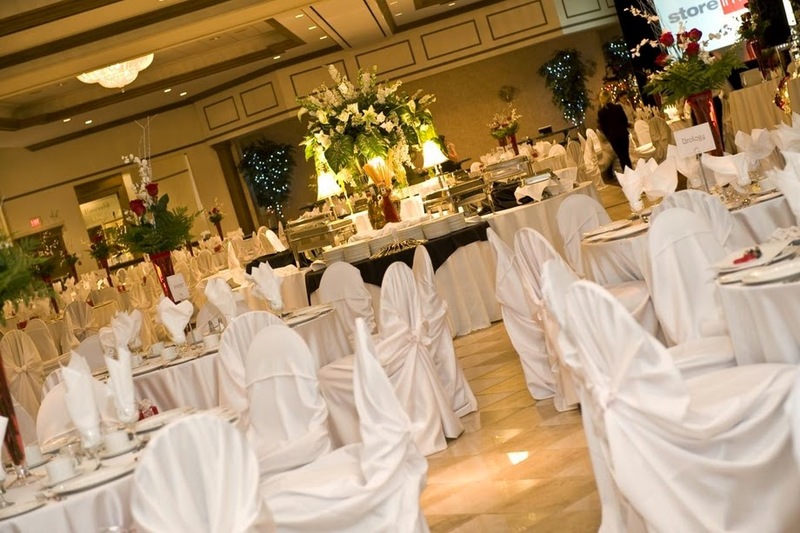 The article notes: Beyond the wedding venue and catering, which cost an average of $13,385 in 2013, other big-ticket items included engagement rings (at an average of $5,598), reception bands ($3,469), flowers and other decor ($2,069) and wedding photos ($2,440). The article also notes that cost will depend on location, which makes perfect sense. In fact, it specifically mentions Idaho, to wit: Couples who got hitched in Manhattan spent the most, at an average of nearly $87,000, up $10,000 from the year before. Meanwhile, newlyweds in Utah and Idaho spent the least, with average spending in both states falling below $17,000. Still... seventeen thousand dollars? On what planet? Granted, Don and I got married back in the dark ages of 1990. But even then I clearly remember being determined to spend as little as possible. We had the most glorious wedding -- holy, beautiful, fun, extravagent, rolicking. Later I wrote an article on how to have a cheap wedding which never got published. I thought this might be a good spot to post the highlights of how we got married on the cheap (with the understanding there was a lot we could have done to be even more thrifty but it would have horrified my more conventional parents). We used my parents' spacious backyard. By choosing a sunny month and not using a building, we were able to save church and hall rental fees. The reception was also held in the yard. Consider using parks, friends' yards, etc. I wanted a very specific type of wedding gown, and could find nothing like it in the bridal magazines. So I went to a dressmaker who specialized in wedding dresses. For the extremely modest price of $450, I got the dress of my dreams. Even after 24 years, I have never seen a dress I thought was more beautiful. When designing the dress, I brought in lots of pictures cut out of wedding magazines - I want this type of bodice, that type of sleeve, this neckline, that skirt, etc. The dressmaker sketched out the design to my approval, then I chose the satin and lace from her selection. I went in twice for fittings. One of the reasons that the price was so low is that I did all of my own beadwork. The dressmaker gave me the pieces as they were completed -- the bodice first, then each of the sleeves -- and I beaded and sequenced the dress myself. The benefit of this, besides the cost, was the quality. I used double thread and sewed each bead/sequin on with a double loop, ensuring that nothing would snag or fall off. Frequently wedding gowns come with the beads glued on, and they don't last. Of course, give the dressmaker sufficient advanced notice that you're interested in doing your own beadwork, and give yourself enough time to do the beadwork. I made my own. I went to a bunch of fabric stores, found the cap frame I wanted, secured some of the satin that the dressmaker was using for the dress to cover the frame, then I beaded the cap, sewed lace to the veil, sewed the veil to the cap, and beaded the veil. It was easy, cheap, and stunning -- plus, it was exactly what I wanted. We didn't want matching rings, since we have different taste in jewelry. Don chose a braided silver band which cost $50. I wanted a solid gold band bezel set with a topaz (I don't care for diamonds). We went to a jeweler who specializes in custom work, described our tastes, and he sketched the designs. When the designs were approved, I chose my stone, and he made the rings. My ring cost $500 and is exactly what I wanted. No getting around this. The men rented them. Because my wedding gown was unusual in design (it had an empire waist to flatter my short height), I wished the bridesmaids to wear an empire style as well. Additionally, one of my bridesmaids (well, bridesmatrons) was heavily pregnant, so a standard dress wouldn't have fit her anyway. Accordingly, I chose a dress pattern in each woman's size, as well as the fabric, and sent it to her. For those maids/matrons able to sew, they sewed their own dress (which cost them nothing, since I provided all the materials). For those unable to sew, they chose a dressmaker and I paid that dressmaker for making the dress. The maids/matrons were instructed to wear whatever hairstyle, shoes, and other accessories they wished. For necklaces, we simply used a single black ribbon around their necks. This kept the costs to a minimum for the bridesmaids. I bought each maid/matron a freshwater pearl bracelet, to compliment the freshwater pearls I used in my veil. Fairly inexpensive and very tasteful. I did use a conventional florist for this, for the wedding bouquet, maids' bouquet, boutonnieres, etc. I kept the styles simple in order to keep the price lower. Others might try silk arrangements they make themselves, or for that matter wildflowers or seasonal foliage (an arrangement of wheat stalks and preserved colored leaves for a fall wedding, for instance). Here I had a tremendous advantage. My matron-of-honor's late mother, a dear family friend, was a talented cake maker. She made the cake as her wedding present to us. An inexpensive option might be to contact cakemaking classes or amateurs for a cake. We didn't want the standard boring old run-of-the-mill invitations. Don (who has an artistic bent) did a subdued watercolor background and we printed the invitations with his artwork. With modern computer programs and the internet, there are all sorts of creative opportunities today that didn’t exist when we got married. Here again we were fortunate. My brother and his then-fiancée (now wife) are classical musicians (he plays oboe, she plays piano). We rented an electronic keyboard piano, and my brother and his fiancée played all the background music, the marches up and down the aisle, etc. This was their wedding gift to us. My next brother video taped the whole wedding and reception. This was an advantage because (a) he's a fairly good amateur video-taper, and (b) he wasn't obnoxious in the way some photographers are ("Hey you! Do something stupid for the camera!"). The result is not "professional" in the sense of dramatic background music, etc., but it's a terrific video which shows exactly how our wedding went. My youngest brother (yes, I have three brothers) has a knack for electronics, so he borrowed some equipment from friends and wired some speakers in the yard, so he could play background music before the wedding, and dancing music during the reception. Ah, one of the most expensive and unsatisfying parts of any wedding. Many of the photographers we contacted were demanding and arrogant to the point of the ridiculous. My mother helped in this search, and finally found a woman who would charge only (!!) $1500 for a few portraits, and we could not keep the negatives. I put my foot down -- there was no way I was going to spend (or ask my parents to spend) that kind of money for a few pictures. Instead, and here's a radical concept, we had no photographer at all. We had friends and family take photos and then reaped the best of their shots. We had beautiful results and never regretted not having a professional photographer. We did pay a minister to perform the ceremony. He was a lovely gentleman and charged us a modest price. This was the single largest expense in our wedding. I wanted to have a potluck wedding reception, with people hired to arrange and serve the food, but my mother put her foot down. She thought (quite correctly too, I suspect) that this would mean she would be in the kitchen supervising things rather than enjoy her daughter's wedding. So my parents paid for caterers to come to the house, where they did a nice display of cold foods (deli items, cold cuts, salads, fruits, etc.) that did not require heating. With some advanced planning, a potluck arrangement is still entirely do-able, and can be fun as well, especially if you hire people to supervise, arrange, etc. 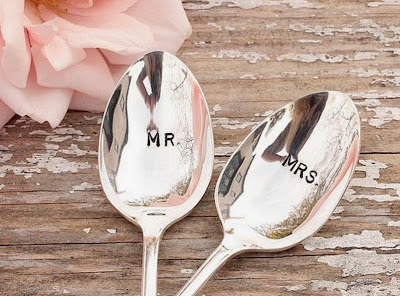 Besides, if you request that guests bring a food dish as their wedding gift to you, it makes for warm fuzzies on both sides (my husband and I didn't especially want wedding gifts, but we could think of no tasteful way to request this). We avoided this whenever possible. The wedding industry is very quick to point out all the things you simply can't be without on your wedding day: printed-up matchbooks, napkins, engraved goblets, special cake cutters, a guest book, feathered pen for signing the guest book, and on and on and on. They imply that your guests will look down on you if you don't have all this stuff. It's hogwash, of course. We had an exciting, memorable, incredibly glorious wedding that was enjoyed by everyone. People came to see us make a lifelong commitment to each other, not to be impressed by our fake-mother-of-pearl-handled cake cutters. I mean, c'mon -- do you really want these things hanging around your house for the next 25 years? The idea of a bride turning into “bridezilla” often arises because marketers convince a woman she simply can’t live without the frou frou. It's hard to keep things in perspective while planning a wedding, but if you keep the important things foremost -- making your vows before God, family, and friends -- and realize that everything else is secondary, you can have a remarkably inexpensive wedding. I'm sure there are endless other ideas for an inexpensive wedding, so feel free to chime in. Even though I'm a dude...I love this post. Probably because I have six daughters heading that way eventually. LoL. Patrice, check out my post about proposing to my daughter last month with a purity ring. You'll love it! Anywho, Wifey and I got married for about $8k. The dress was around $700. Friends of the family made the cake. Photographer and DJ were not cheap but no too bad. Photos were still on film only at that time so it may be cheaper now with digital storage. The film is one of the few things that survived our house fire in the safe. Honestly, I don't even remember the food (shh, don't tell Wifey). We did a "dollar dance" where Wifey and I danced individually with everyone and they casually slipped us whatever dollar amount they wanted and we used that for our honeymoon. We rented a lovely mansion from the 1930s where they offer ceremonial events and had the wedding there. It was beautiful. Perhaps being a man makes me ineligible to comment. But I do wonder about the $5,598 engagement ring. Not only does it not make any sense (I own exactly $0 worth of jewelry) but it would seem be a foolish act as well. Most young people don't need $5,598 worth of debt to start their life together and if the man/couple had that kind of money it would be better spent on a house or preparing for their life together as opposed to some vain display of phony wealth/love. But also a ring like that puts you at risk of an robbery kind like having a stack of $100 bills sticking out of your shirt pocket. Why? Is the brides ego so fragile that a $5,598 ring must be displayed to make up for her shortcomings? Why not a modest set costing about $500? I'm sure someone can set me straight and explain my chauvinsim. My fiance and I skipped engagement rings altogether. In fact, I proposed to him with a 50-cent vending machine ring! We're planning on getting some simple bands made for our wedding. As a female, I really don't understand what the big deal about a big rock is anyway. My taste in jewelry runs towards simple, and I didn't want a big rock that would get caught on stuff, potentially lost, etc. Not worth the hassle and definitely not worth any debt! I never understood why the rings are considered part of the wedding cost. 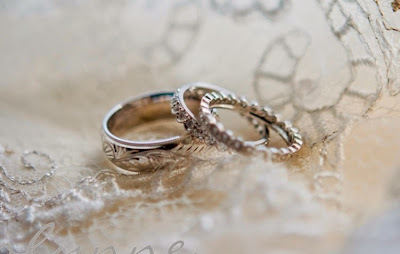 The wedding lasts one day, but I think of the rings as an investment. Gold/diamonds go up in value, whereas money spent on the wedding (especially the reception) is gone in a flash. When we were shopping for wedding rings, I had already decided that a plain gold band would be fine because my husband to be is a blue collar worker. But he was looking at diamonds, so in the end I got a beautiful set that I absolutely love for around $4,000. I was happy to buy something expensive for him (with diamonds) but he didn't want it; he wanted something similar to his Dad's gold band. We found a jeweler who made a beautiful design with a dove and a cross; I can't even remember how much it cost, but definitely under $1,000. Because we were middle aged, I didn't want a traditional white wedding dress, and I really wanted something that I could wear again. I bought a long black skirt and a brightly colored silk jacket at Nordstrom on sale for about $200, and have since worn them to the theater a number of times. Flowers were very important to me, and pictures were important to my husband. We spent $200 on the flowers and arranged them ourselves including the bridal bouquet, and a friend took pictures for $200. We received compliments on our wedding and my dress for a number of years. We married at church and had the reception in my in-laws tiny back yard - My father-in-law had access to an open tent via his workplace and he paid for all new sod to be put down. It looked so nice. We peeled mounds of potatoes for potato salad and family members brought food. I don't remember any food except the potato salad and the huge vat of rum punch that my brother-in-law's Jamaican father-in-law bought. My uncle-in-law provided the music - even then, in 1977, he had the latest electronic equipment and the music was great. My mother-in-law made my dress and rebeaded the juliet cap she wore when she got married. I made my sister's dress. She was my only attendant. I remember the flowers being expensive but don't remember the cost. Today I would do silk or wildflowers as you suggested. Or maybe carry little mussy tussies made from lavender. Patrice - I'd love to see a picture of your gown. Shocking...and too believable...especially the part about spending almost $6,000 on a ring...remember, there was a time when the Diamond Industry was pushing 2 Months Salary as the proper amount to spend on a ring, which makes my brain bleed. I am blessed from several angles here...My mom let me use her old ring for an engagement ring, and the woman who let me marry here has great common sense and perspective. I was the one pushing to spend money. She convinced me that instead of a photographer, go buy a bunch of disposable cameras...then put two on each table and a box to drop them off in at the end of the reception. Like you, our biggest expense was the caterer...just like at my mom's recent wedding. In both cases, we originally planned on a 'pot luck' type feel, but decided things were stressful enough without that...it's one of those times writing a check feels okay. Aw, heck. Was hoping for some wedding pics of you and Don!! Anyhooo...agree there is no reason for any wedding to cost a fortune. These days there is so much 'froo froo' that it takes away from the simple sacred charm, holiness and shared joy of wedding that ought to be front and center ..IMHO. Ha! Totally agree with so much of the froofy nonsense being just that. Another reason it's great to be a Mormon (married in a gorgeous temple, reception in a church hall....all free!) We spent just under $2000 in 2008 (not including rings) and I made sure to purchase the services of an up and coming photographer. Never regretted those images. All the extra "stuff" takes away from the sacredness of the whole point of the day. We didn't have a wedding party, but opted a few intimate family restaurant dinners instead. No cake cutting, etc. Just what we wanted. I only regret not having some video of the day. Oh! I should also add the we saved most of our budget for our honeymoon. It's OUR wedding, right? We couldn't even afford what the rest of you spent. We went to Las Vegas and were married in a chapel. We both were wearing blue jeans. My ring was bought a few days later after we received a cash wedding gift. Total cost maybe $300 and the gas there and back. We have been happily married 28 years. We had a garden wedding in a friend's beautiful yard with music from her antique organ. I made the wedding cake and we had a pot luck reception. The food was great as there are some wonderful cooks here. We were surrounded by flowers and friends. been almost free eighther. And we have been married 36 years. I guess I rate the cheapskate award here. My finance's aunt was a judge, now departed from us, who married us in her office. No rings, few photos by witnesses...all family, no special dress, none of the nonsense. Here we are 20+ years later both still satisfied with each other and both pretty happy. First wedding was an elopement - Navy chapel the week before Christmas. Husband wore his dress blues & I wore a beige jumper with long sleeved white silk blouse, my dress up clothes as I was still in college. The chapel was decorated with greens and poinsettias and lots of white candles, which we replaced. Just a couple standing up for us. Went to a nice restaurant with other friends who paid for their own meals. That was in 1967. Cost for rings was about $100 thru the Navy Exchange. Loved that wedding and have great memories. Photos were taken by those attending. The following July we had a wedding for our parents, family & friends with the minister full knowledge and approval - in my parents church with reception in the church hall. That eliminated band, dancing & alcohol. Had a buffet of snacks & salad before a sit down dinner. Cake was done at a local culinary school. Flowers were from a local florist with my Mom's 30% discount thru Sears employee's deal. Mom made my wedding dress & veil - hated them both because she insisted on satin and I wanted a linen like material I could shorten and use for work. I donated that dress to a church run shop within the year. Bridemaids' dresses were made by them and we provided the material - a linen ike material and the 3 women all shortened the dresses to wear for work. Had typical cream colored formal invitations. Photographer took the standard photos which were nice but he came wearing the world's worst toupee, but we did have great smiles on our faces! Cost back in 1968 for all was just under $600 not counting rings or a honeymoon. Frankly, don't have many good memories of that wedding - it just wasn't what either of us wanted. And no, neither set of parents ever knew we had been married earlier. Wish now we had told them and foregone the formal wedding and just taken the money if they'd offered. My advice to everyone - have the wedding you want, set a budget and stick to it. It's a day that should be filled with happy memories and not one filled with stress, worry, tears, arguments and debt. Holy Socks Batman! $87,000 for a wedding? I only paid $81,000 for my house. I cannot understand paying that kind of money to impress a bunch of people. My wife wore a lovely dress she and her mother made at home. I wore my best blue suit. We were married in a small chapel where my wifes family had attended services for generations. The reception was held in her parents yard and food was provided by family and friends. Flowers were from our local gardens and were arranged by my mother-in-law. Our rings were chosen by my wife and are simple gold bands. The one thing we kept in mind was that we were making a commitment to each other in the presents of God. I have been married for 28 yrs and 7 months as of tomorrow. My wedding was wonderful. Due to people wanting to "crash" a private ceremony, my fiancée and I drove to the same town my grandparents and parents were married in. We submitted paperwork for a marriage license and went back the next evening to get married. We paid the chapel $50 to perform our wedding (it was a female minister), gas two trips (definitely not $3 a gal), dinner at Golden Corral (probably at the most $15 for both of us). I wore red, he wore blue jeans! It was grand! We came home and called our parents to announce that we were married. I will see my sons married the same way or as close to it as I can! I love him more now and am looking forward to my next anniversary! Oh, the ring, I did have to get a new wedding set at 13 yrs, I wore the engagement band out twice! We were married in 1980, in Hawaii, and spent about $300, including rings. My dress was second hand (free), my husband had his tuxedo custom made in Korea for $75, our rings cost $150 and the flowers cost $75. The cake was free, the food was donated and my mother and her husband paid for a beer keg. The minister was an Army chaplain and we were married at a military chapel, so they were all free. Our neighbor took the photos and just gave us the film to develop when we could afford it. It was beautiful. We just celebrated our 34th anniversary last month. I have personally known couples who have spent thousands of dollars and their marriages have not lasted very long at all. So just because they spend LOTS of money doesn't mean they will stay married. Our young people go 40k$+ in debt (each) for college .. then they spend 30k$+ on a wedding. Now they owe over 100k$ and they are renting. Along comes kid #1. Finances being one of the top contention points in a marriage, its small wonder the divorce rate is high. People invest everything in the party and nothing in the years to follow. My husband's uncle, a retired minister, was getting married in Colorado for the second time. His first wife passed away years prior. Uncle Burton, at 81, wanted a simple and inexpensive wedding. He asked the pastor of their church to do the service directly following the regular church service on a day that a church potluck was already planned. No invitations were sent, a family member who was informed earlier brought his camera, the pastor made an announcement that the wedding was taking place right then and there and then everyone went to the potluck to celebrate! Pure genius! The only thing they paid for was cake and it wasn't a fancy wedding cake, just a couple of large sheet cakes with writing. Whew. Coming up on 21 years here in a few weeks. Our entire wedding, including a 2 week honeymoon to Michigan, cost about $5,000. (Most of that was the traveling.) My dress was a $200 floor sample that didn't need much alteration. I did the silk flower bouquets. A friend of my aunt baked the cake. I had fun, but if I had to do it over, I'd elope! We were married in my parents home with both sets of parents as witnesses. To me the engagement ring was a plain gold band but after I got some money ( I had left college but my wife was still in school) I purchased a small diamond engagement ring. The second ring never meant anything to me, the first one did as that was when I made my commitment. My wife's dress was a very nice blue one that she had made, I wore my only suit coat. I still remember when she walked through the door, stunning. I remember the very heavy burden thinking that this was for ever and that was daunting to me at that moment (a splash of cold water type of moment) but I very quickly realized that this was right for me and I hoped for her. Part of the reason for the small wedding was the lack of money and the desire to not waste money. We honeymooned in our upstairs apartment that I had rented a few weeks before near where I was working. We were married on April first but don't ask me the year, 1967 or 8 so we are coming up on the golden anniversary. I guess I need to look at the marriage license so I can prepare. Best thing I ever did! I completely agree with you! We live in Fairfield County, CT, which is one of the costliest areas in the US. We're not in that "gold coast crowd", however. We got married just about 15 years ago and spent $10,000 for everything - clothing, flowers, dj, rings, venue, honeymoon...all of it! We paid for the wedding ourselves and worked lots of hours to do it. We'd do the same thing again because we were able to buy a house shortly after we got married. I don't understand the craziness of wedding spending at all. Mom and I made finger food, sandwiches, and lemonade/tea. My husband's parents provided a keg of beer. Cost: I don't remember, but I know it was under $100. My dress was a lovely floor length white lace and cotton frock (that's what I call it and I'm sticking to it) from the clearance rack. As I am tall and slender, it fit perfectly. No veil. Cost: $45. My husband did not want a ring and mine was a simple gold band. Cost: $120. Friends and relatives at the backyard party that lasted until 10:00. Oh, and this was back in 1976. If he hadn't died, in 2 years we would have been married 40 years. We did our wedding for under $5000. I made all the bridesmaid dresses and my own, arranged my own flowers, built a garden in my parent's backyard 8 years prior, made the cake and did costco platters for the reception. The bulk of the cost was renting tables and tents and a PA system. A friend in college got married (while in college), in the back garden of a historic building on campus (they discounted the rental rate for students), in a dress from the Ren faire, with a potluck reception. It was perfect. We took it a step further, because if my mother and I had had to plan a wedding together there'd have been a murder. And there was no way she'd have let me plan it on my own without her input. My mother had a snit and paid for a family reception a couple months later so that our family could meet my husband. But even that wasn't high end, I never got the total numbers (my mother refused to tell me), but the music was done by a professional DJ who just happens to be a cousin-in-law (it was his wedding gift to us), and the cake was done by the wife a good friend (it was their wedding gift). Catered by the hotel that it was held at. My daughter was married this past June, due to an illness in the family we had to speed everything up, like a year and a half. So, as we planned, we did as much ourselves as possible, but because of the short time frame I was unable to shop around for a few large ticket items I knew I could have gotten cheaper. We were truly blessed with family and friends who worked hard, and gave us referrals to their friends for some things. In the end we spent about $14,000, but, if I had had more time, I know I could have brought the price cheaper. Over the last 5 years I have attended two different weddings. One was pretty over the top and I'm sure they spent a pretty penny on it! The other was practical, not cheap, but very simple, with probably the most money spent on food and DJ, but still reasonable. I felt the love and meaning of the event so much more at the simple one. Our wedding was not super cheap nor super expensive at about a third of the 'average' wedding. It was very nice. Nothing important was missing though we did cut some (in our minds optional) corners like not having a band/ DJ or having beer and wine instead of a bar setup. A few years ago we went to a lovely wedding that I happen to know cost about 2k. They rented a small room at a building on the water in the PNW. The ceremony was done in a cute courtyard and they did pictures overlooking the water. It helped considerably that they were very 'crafty' people. She sewed her own dress and they did all the decorations their selves. The photographer was a friend and the DJ was an IPOD with some speakers. Weddings are an important event. I do not however think starting one by borrowing money(or using a ton of money that should go to say an emergency fund or a home down payment is a good idea. If people have lots of money and want to spend it then rock on. Especially in places where people make a lot of money and tend to get married much later I can see how those areas wedding expenditures are higher. Pardon my cynicism, but I have a hunch that divorce rates are directly proportional to wedding costs. When we got engaged, husband took me out to look at the rock of my choice. I pointed out to him that I *never* wore jewelry, so why start now? A simple gold wedding band was fine for me for ceremonial purposes, but I don't wear that, either. It is around here somewhere, I suppose (37 years later). Our expenditure for the wedding included plain gold bands, the license, and the preacher fee. That was pretty much it. It used to be that wedding receptions were ham buns, potato salad, relish tray...etc. Cold weather was usually ham slices and scalloped potatoes. Then they had to keep on upping each other. I belong to a club that rents out a reception area. The best idea I saw for a cake was from a young lady paying for her own wedding on a tight budget. She had a very small tiered cake for the picture and served cupcakes with white icing ...no decorations. The stacked the trays on different size boxes to "look tiered" (sort of). Another did an interesting favor for the guests. She had shopped candy sales and set up a little table with bowls, scoops and little white bags. Darling! I did actually get a nice filled sheet cake from the local grocery. Excellent cake for the price. The girl was so excited she was going to get to decorate a wedding cake and just had to know the "colors". I let her do whatever she wanted, it was beautiful. Honestly, no one really cares if the pieces of cake aren't traditionally shaped. 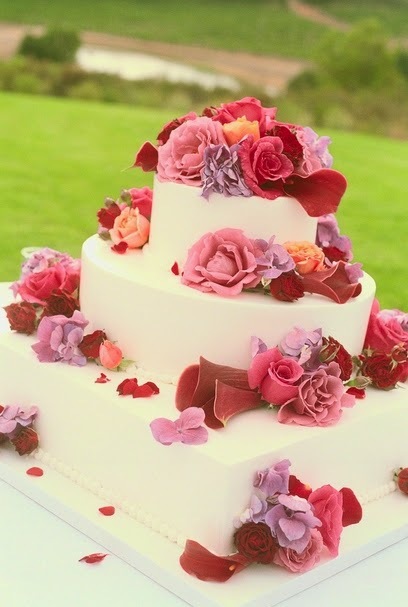 Instead of fancy decorations on the cake, we just had it sprinkled with rose petals. One idea I see in photos that I wish I had used, because it is so elegant - instead of a mixed bouquet, each lady carries a single stem of a large or very striking-shaped flower. Can be stunning. Let's see...to prevent the drama that comes along with having two drunks and one mentally ill person in the family, we eloped. License fee - ?Maybe 20? Week in hotel - I forget, but something sensible. Officiant - a close friend, for free. So maybe $2600 at most. Married at home with no fuss, signed the license on my dining room table. Don't regret a thing. Been married over 30 years. Got married at church during December when the church was already decked out in poinsettias for Christmas, so saved money that way. Bought a returned wedding dress that was lovely for $175. Had a cousin take pictures, no limo--just borrowed my inlaw's big car. Fancy weddings are indeed fun to attend, but I'm always stunned by how they go overboard! (One wedding had trumpeters stand on either side of the entrance blowing their trumpets when the bride walked in! We still laugh about that. I was married in 2005 and we spent less than $5000 for the entire wedding (about 250 people attended). We held the wedding in the late evening on a Friday night as the banquet hall was FREE if you spent a certain amount on food, which we did having appetizers and cocktails for our guests. Our silk flowers, cake and dress alterations were gifts from my family. I bought my (over $1000) dress online as a previous year's sample and paid less than $100 to have it shipped to me. Very economical wedding and I STILL have people comment on what a good time they had at our wedding. My wife and I had a kind of mantra, during the wedding planning. "Bride. Groom. Priest. Witnesses. Everything else is optional." Helped keep us sane. I will admit...we spent more money than we probably should have. Mostly because we invited (and paid to feed) 160 people, and 32 actually bothered to show up. For her dress, for example, we engaged a dressmaker who does a lot of work for SCA folks. And even after factoring in the cost of flying us both to Albany to sit down with the lady in question, it was _still_ significantly cheaper than the stuff you'll find in bridal mags. Better-looking, too. One of her old friends is a professional photographer...we did pay him (of course), but he gave us a deal. A friend of my aunt's is a jewelry designer...likewise, we got good terms. It's worth paying for professional quality, but working with people you know, to whom you're more than just another cookie-cutter client, is a terrific experience. The worst (and, I might add, overwhelmingly most expensive) vendor was the reception/catering place. Beautiful, but too focused on catering to status-conscious would-be Bridezillas whose families are picking up the tab. The wedding is over in a day. The marriage lasts a lifetime. Focus on what matters. My husband and I got married 17 years ago and paid less than 3000 for the total wedding all 3 rings, dress, tuxs, venue and reception venue food and drinks for the reception and the honeymoon. It was a beautiful event it was a lot of fun and I have the best memories. And most of all we asked for money instead of presents and that paid for all of it with some left over. I just was married on the 13th so while I'm a bit late in commenting I thought I'd share our details while still fresh in my mind. The ceremony and reception were held at a specialized chapel / cabin location and they took care of the catering, and much of the decorations. I realize a chapel may bring up images of some tacky place in vegas, but it was a very wooded location with flowers and small water streams/falls, as well as vacation cabins nearby. We received many compliments on how beautiful the location was for our wedding. It was a small wedding too so that is probably the main reason our cost was kept down. We chose a cheaper lunch type menu rather than a more expensive dinner entree option. Total bill was around 3500. Wife found some cheap vintage crystal for center pieces at the reception, and made some of the table decorations herself. We did have a guestbook frame that would have cost 95 dollars, but she just made one herself using a similar design, and it turned out beautiful. Maybe 10 dollars for a canvas and some paint, and another 10 for thrift store crystal. Plus time for making the decorations and guestbook. We didn't get engagement rings, and went fairly simple for wedding bands. Mine was just a silver band that cost 80 dollars, and hers was silver with a blue sapphire and a couple smaller white sapphires. It cost less than 300 on special I think. Not sure how she did it, but found a nice wedding dress for around 300. Rather than renting a tux, I just bought a new suit on special, and had the best man wear a suit he already had. I believe the total cost was roughly 300, and I now have another suit I can wear for special occasions. The cost for a minister would have been 100, but we just asked our Pastor, and gave him the 100 that came off the total cost. Photography was worked into the price from the wedding chapel, and we chose a 48 picture option which was cheaper on the total cost. Plus pictures/videos from family and friends. My wife is a pianist and knows a classical violinist so she did the ceremony music, and we gave her I believe 150 dollars. For the reception, I just burned several hours of mixed classical music I had in my collection and had the chapel play them during the reception. No cost there except for 3 blank CD's and a few hours of my time. Probably a few other small details I'm forgetting about already, but the total cost was about 5K.